Meet Luke. 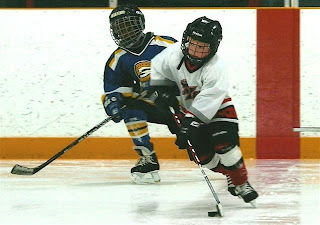 He is 7 and already a hockey veteran. He just finished his 3rd season of league play in the Winnipeg minor system. He’s pretty good too! Luke has an on again off again relationship with his hockey card collection, but he certainly looks after it. Each one is carefully encased in a nine pocket plastic sleeve and kept in a binder. It's not like in my day when they were attached to your bicycle with a clothes peg in order to make a motorcycle sound in the spokes of the rear wheel. Or they were flipped at a wall. I remember the game as “closeys”. The winner was closest to the wall and the reward was that you got to pick up all the other gamers cards to add to your collection. Not a lot of perfect condition cards survived that need to play various games with them. But you only paid about five cents for a pack of 5 or 6 cards and some really awful bubble gum back then, and that’s about all they were worth. The collector hobby and ebay changed everything and today some of those way-back cards, in perfect condition, are so rare they fetch hundreds, even thousands of dollars. I never got wealthy with my collection and it isn’t likely that Luke will either. For most of us, the collector hobby is more than cash value. It's about the memories. Luke likes to trade doubles with his friends and he saves his allowance to buy more packs. Recently, a family friend gave him some new Winnipeg Jets cards and he was thrilled. Out came the binder to be reorganized. Each one of the Jets was carefully put away to admire again and again. His Mom Laura helped him. She’s a big Jets fan. 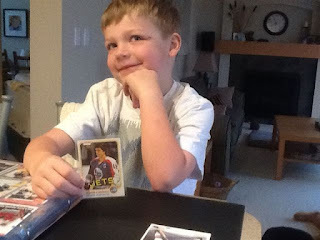 While they figured out which card would go where, Mom happened to mention that she had a card of one of the original NHL Jets, a card from the 80’s and that he was named after that player. Luke was intrigued. Laura quickly dug it out of her box of memories and gave it to him. Luke could hardly believe that his Mom was cool enough to have such a great old card, and it came in a hard plastic protective sleeve. No way was this one going into the binder. It had to have a special place in his room. I met Laura when she was 16 and in grade 11. She was our son Jonathan’s first real girlfriend. She told me how Morris “Luke” Lukowich was her favourite Winnipeg Jet. She even had her own Lukowich #12 Jets jersey and still does. It was me who gave her the cool card in the hard plastic protective sleeve all those years ago. The first time she dated her now husband Mark, they talked about Luke #12 and he was impressed with her prized card. Naming a son Luke always seemed like a fun idea to them and when they actually had a boy, they went with it. Laura knew that one day she would give that Lukowich card to her son. She was glad she waited until now at a time in his young life when he was blown away. Little Luke loves the Luke card and his Mom. My father saved all of his hockey cards from the 1930’s and would show them to me when I was a kid. They were Beehive and Quaker Oats. Included were players from teams that no longer exist like the New York Americans and the Montreal Maroons. After our son Jonathan began collecting, my Dad gave me his collection, with one major condition. I was not allowed to sell those cards from the 30’s but had to promise to put them with the cards I had saved from the 50's and one day pass them along to my son. Just like Laura and Luke, Jonathan and I worked on his collection together. He too was about 7 when he got his first pack. One thing led to another, and it grew far beyond cards into autographed photos, pucks, sticks, balls and jerseys. More than 200 cards also got signed over the years. When he died in 2008, Jonathan and I were working on a couple of specific memorabilia projects. He idolized former Toronto Maple Leafs captain Wendel Clark. That’s why he wore #17 in both hockey and lacrosse. Our mission was to recreate a specific Wendel jersey, just like the one you see in the photo - Wendel’s autograph on the numbers. 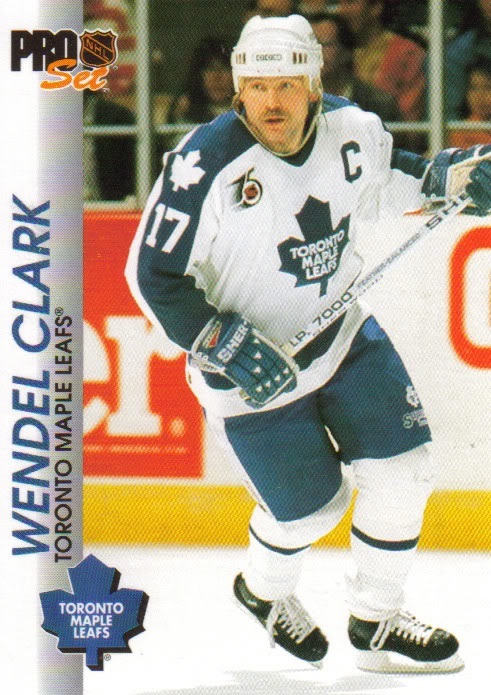 Clark signed three dark blue Leafs #7’s for me several years ago, but that’s as far as it got. The problem was the same then as it is today. That particular Leafs jersey is impossible to find. One day though, the project will be completed. After he passed away, Jonathan’s wife Anna made sure that his collection of cards, photos, jerseys and balls came to me. My full circle will now be the day I give my collection to our grandson Jonathan, named after his Uncle. He'll have hockey cards and memories from his Great Grandfather, his Grandfather and his Uncle Jon. He’ll need more than a binder with plastic sleeves to hold everything, he’ll need a small museum. But, just like Laura and Luke, I’ll be there to help our grandson organize his favourites.